Paints & Pintos look exactly the same, their only difference is all in their bloodlines and registration. In the simplest of terms, all paints are pintos, but not all pintos are paints. Pinto is a blanket term used for a collection of similar white patterns that can occur in a wide variety of breeds. 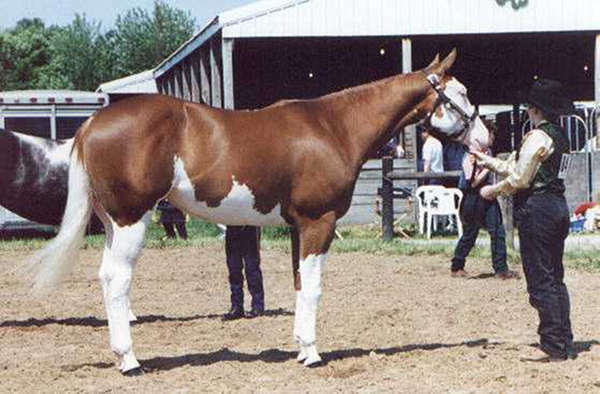 While the term paint is used to describe pinto animals with either Thoroughbred or Quarter Horse bloodlines registered as a paint color breed. Pinto terminology changes from region to region, however there are some fairly universal standards when it comes to white patterned horses. 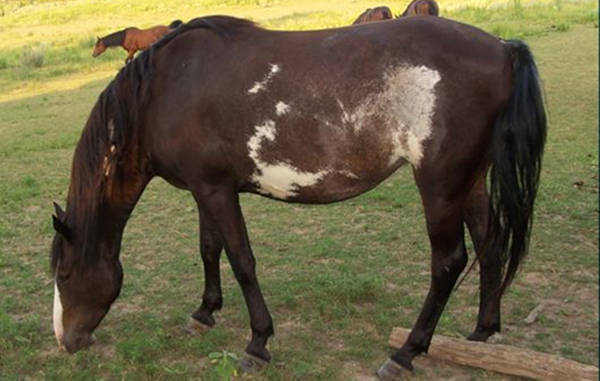 Piebald pintos are the result of a pinto white pattern on a black base and skewbald pintos are the result of a pinto white pattern on a chestnut or bay base. Pinto white patterns have an affect on any base, modifier or dilution and come in perhaps the widest variety of colors & patterns. Frame is an overo pattern and given the name because their pattern resembles a frame of color surrounding their spots, which are often jagged in a horizontal arrangement. They generally have dark legs, white markings on their face and at least one blue eye. 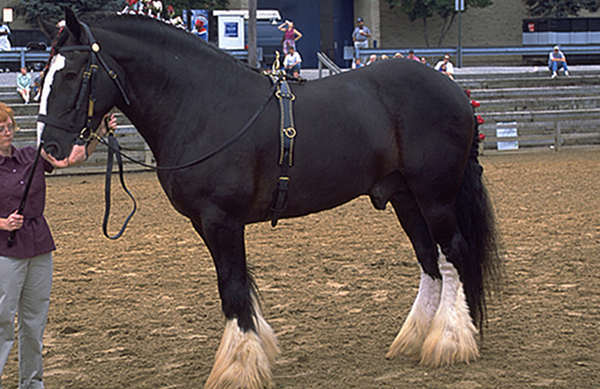 Some frame pintos have almost no white on their body but will have bright blue eyes and at the other end of the spectrum this gene in its homozygous form is lethal and produces Overo Lethal White Syndrome. The sabino name itself comes from Northern Europe, however in Spanish Sabino means pale red or red roan and in South America Sabino specifically means flea bitten grey. 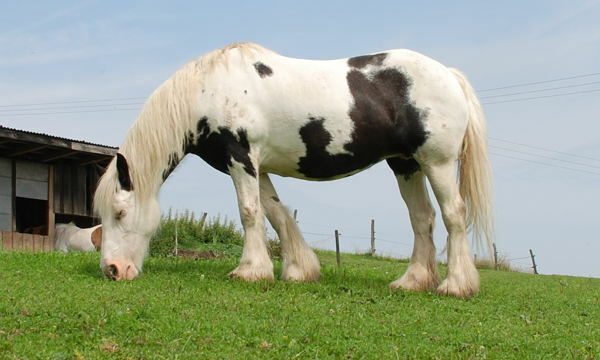 When used to refer to pinto patterns sabino is an overo spotting pattern that is found in almost all spotted breeds. This pattern generally has white markings on the face, a white lower lip or chin, one blue eye and at least one white leg. They may also display white knee patches, roaning, pigmented skin under white hair and freckling around the soft spots. This is another overo pattern and one that is often mistaken for frame or sabino. Splash white animals tend to look like they’ve been dipped in white paint, they generally have spots only on the bottom of their face or a full white head, at least one white leg and white along the belly, usually in distinct horizontal pattern and at least one blue eye. 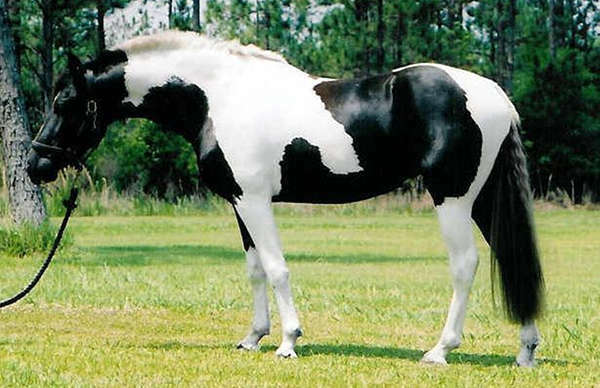 Tobiano is by far the most well known and easily identified pinto patterns and is created by a dominant gene. They will generally have white legs, solid colored heads and brown eyes, while their spots are round with clean edges and usually arranged in a vertical pattern along the topline between the ears and tail. They may also display a bi-colored tail with a skunk stripe; small spots of color called ink spots, paw prints, or cat tracks; mottling or roaning of spots as pigmented skin extends into white hair called shadow paints, ghost paints, ribbon paints or halo paints; ermine spots; color around their chestnuts and even a solid body with no visible spots. 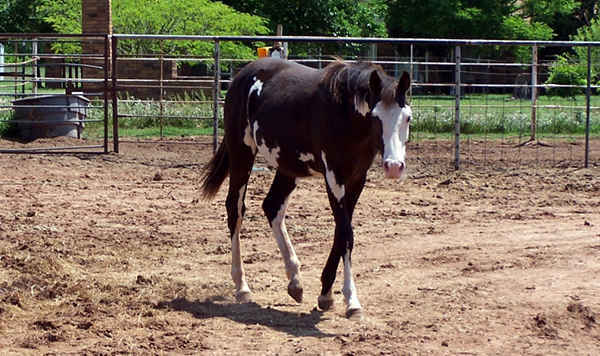 As the name implies, this pattern is a combination of tobiano and overo characteristics and genetics. The expression of this pattern is difficult to categorize simply because its effects vary a great deal from animal to animal. However there are a few general traits they may display including; markings on a field of white; at least one blue eye; spots on the muzzle,chest, neck, flank and base of tail and white bodies with colored heads or ears called moroccan pattern or medicine hat. 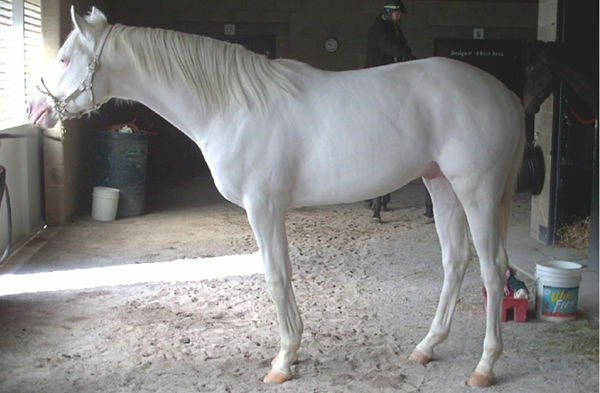 Often mistaken for greys, or a cream dilution, dominant white is in the sabino family of patterns. This is a dominant gene and similar to human piebaldism, animals can be totally white and are often considered ‘true whites’.